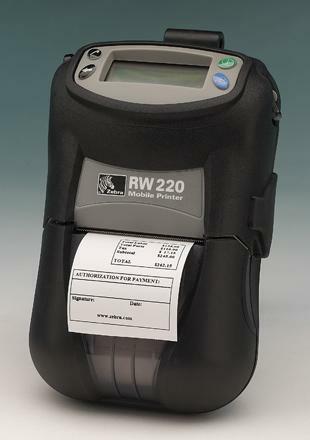 Designed for the Road Warrior, the Zebra RW Series is a mobile printer ideal for printing delivery receipts and invoices on the go. Its modular design allows users to choose among wireless options, card readers, and integral accessories such as vehicle mounts for simplified route printing. Its convenient vehicle mounting and charging options, as well as its user-intuitive interfaces and angled display, allow for easy use while on the go! RW220 DT 2.2" 1" - 2.37" 203 3 IPS 2.25" .75" or 1.38"
RW420 DT 4.09" 2" - 4.12" 203 3 IPS 2.25" .75" or 1.38"